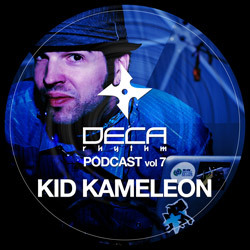 A podcast done for Deca Rhythm. The Techno/Dubstep hybrid sound he was into at the time. The Soundcloud mix is down, but click the cover to download an mp3 version. Tracklist is here. Late 2011 podcast for J’aime Le Dubstep which became High on Beats. On the UK Funky/Dubstep tip. Honored to have a guest spot with Tom Ravenscroft on the BBC! There was an interview too but the audio from that has been lost to time. Kid Kameleon got into Footwork pretty early. This was a mix of it for Percussion Lab. It’s hosted on their site. A live recording of the Forest Stage set at False Profit’s 2011 Priceless Festival. Tinker and Kid Kameleon curated the entire stage that year. Hip-hop and future beats of all kinds. A very special mix for Rob Booth of Electronic Explorations that was created out of discarded loops from about 40 different producers. Read all about the process. A real honor to do an EE mix. A joint mix Tinker and Kid Kameleon made for the Kaboogie mix series ahead of their 2010 Europe tour.